An Opinion On Sports: Gurley & Marshall & Glory Glory to Old Georgia! They're only freshman. They will get better, but they will experience some bad days as well. They are extremely talented when running with a football. They will be fun to watch for at least three years (come on guys, stay all four!). Todd Gurley and Keith Marshall, two of North Carolina's finest. Good friends, roommates, UGA tailbacks. They each rushed for 100+ yards against Florida Atlantic Saturday night. Gurly had 10 carries for 111 yards, while Marshall totaled 104 yards on the same number of carries. They each added on a touchdown for good measure. These two true freshmen could end up being the best two-back tandem since Worley and Henderson of years ago.There are too many great Bulldog running backs to start name-dropping comparisons at this point, but father time will take care of that. If they ever get to run behind an experienced offensive line with depth, the sky could be the limit for these two. 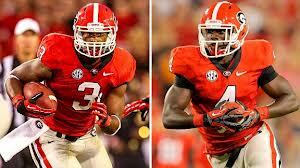 So 'Bulldog Nation', sit back and enjoy misters Gurley and Marshall. They are indeed special, and they are the "Real Deal". Here's to many more co-one hundred yard outings, along with many more Georgia victories!